In yet another clear example of the many ways in which Apple's iPad is changing the status quo in multiple facets of life, it may soon become a reality in the state of Georgia where textbooks are a thing of the past. If Georgia state legislator Tommie Williams has his way, every middle school classroom will boast one iPad per student, each loaded with the study materials and course work pertinent to their individual classes. 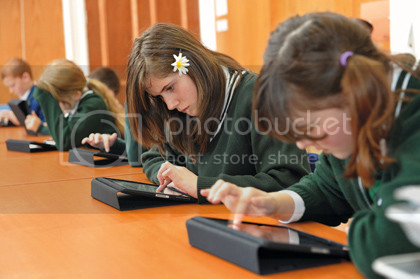 "Last week we met with Apple Computers," Williams told the Atlanta Journal-Constitution, "and they have a really promising program – for $500 per child per year, they will furnish every child with an iPad, wi-fi the system, provide all the books on the system, all the upgrades, all the teacher training – and the results they're getting from these kids is phenomenal." The real value in making the switch from school books to iPads, however, comes over the long haul. "We're currently spending about $40 million a year on books," Senator Williams added. "And they last about seven years. We have books that don't even have 9/11. This is the way kids are learning, and we need to be willing to move in that direction." Although pilot programs involving the incorporation of iPads into the classroom are already underway in many parts of the US, the potential development in Georgia would represent a massive shift from business as usual in contemporary classroom education. And according to Senator Williams, there's a strong possibility the Georgia will pave the way for electronic tablets becoming a permanent substitute for printed textbooks in the classroom.